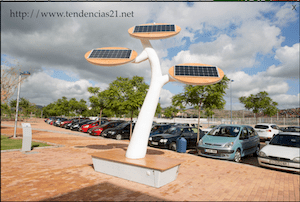 According to the online news source elmundo.es, two college students from Castellón, Spain, have designed a ¨solar tree¨ that will provide a source for students and faculty to charge their phones, tablets, and laptops. Alba Escorig and Fernando Tomás of the Universitat Jaume I explain that their prototype solar tree uses photovoltaic cells that work during the day to deliver a charge range of six hours, and at night acts as a street lamp, shedding light for some four hours after dark. Passersby can sit on the bench provided and use USB or conventional electrical outlets to charge up their devices while they take a break.